The Samsung Galaxy Book 2 is the latest 2-in-1 notebook from the company, and it is focused towards users with portability and battery life in mind. The Galaxy Book 2 comes as the successor to the Galaxy Book that was launched last year at the CES. The device is powered by Qualcomm Snapdragon 850 processor, and it runs on Windows OS. This Windows device features a 12-inch AMOLED touchscreen display, and it has a detachable keyboard. This 2-in-1 weighs just 1.75 pounds, and Samsung promises 20 hours of battery backup with it. Below are all the details that you should know about Galaxy Book 2. Samsung Galaxy Book 2 price in India is expected to be Rs. 90,000. Samsung Galaxy Book 2 is due to be launched in December 2018 in India. Why has Samsung used Snapdragon 850 processor in the Galaxy Book 2? Unlike most other 2-in-1 notebooks, which use Intel or AMD CPUs, the Samsung Galaxy Book 2 uses Qualcomm Snapdragon 850 processor. The Qualcomm Snapdragon 850 is a mobile chipset that has been modified to run the Windows operating system. The main reason behind Samsung opting for the Snapdragon 850 SoC over the ones from Intel or AMD is that it is significantly power efficient. Another reason is that it has inbuilt LTE modem, which will enable on-the-go cellular connectivity. Samsung promises 20 hours of battery backup with the Galaxy Book 2, which is surprisingly good for a device that is so compact and for a one that is running Windows operating system. The main reason behind this great battery life is a low power consuming Snapdragon 850 SoC. If it would have been an Intel or AMD CPU, I doubt if the device could even offer half the battery backup that it is promising now. That being said, the Snapdragon 850 is not as powerful as the other notebook CPUs. Therefore, I think you shouldn’t expect the Galaxy Book 2 to have a super-fast performance. 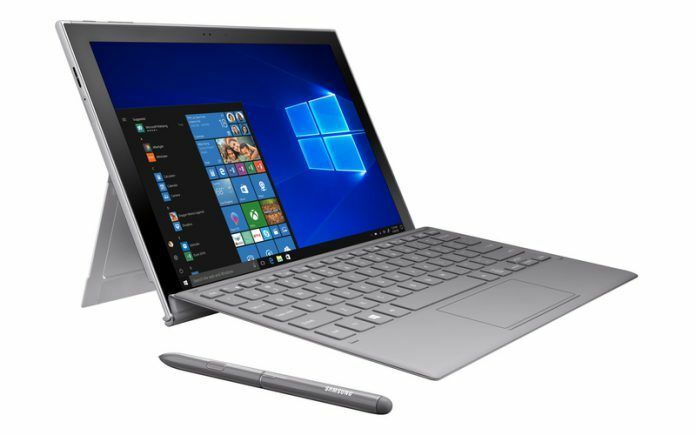 Although the Samsung Galaxy Book 2 is running Windows, which is excellent for productivity, its limited physical ports restrict the device from it being used as a full-fledged notebook. The Galaxy Book 2 has only two USB Type-C ports. There is no USB Type-A port or even a full-sized SD card reader. Also, the detachable keyboard isn’t the best for typing for long hours. As the Galaxy Book 2 comes with Qualcomm Snapdragon 850 SoC, I doubt if it can run any popular gaming titles smoothly, due to the lack of graphics power. Other notebooks with Intel and AMD CPUs won’t have this problem. There we are, another capability has gone for a toss. The Samsung Galaxy Book 2 comes with a 12-inch Super AMOLED display. Most other notebooks use IPS LCDs, which aren’t bad, but not as good as Super AMOLEDs either. The sAMOLED displays have deep blacks and a vibrant color tone which makes the content on display look more appealing. Considering that 2-in-1 notebooks will also be used outdoors, their displays having good outdoor visibility is crucial, and the Super AMOLED unit on the Galaxy Book 2 specializes at that. There is no doubt; the Galaxy Book 2 will be great for outdoor usage. With all that the Samsung Galaxy Book 2 has to offer, the $1000 price tag seems too much. Other 2-in-1 notebooks come at half the cost of the Galaxy Book 2 while also offering more powerful processors. It is true that the device is very light and portable, but even considering that, I don’t think it is worth spending $1000 for a Galaxy Book 2’s hardware. At this price point, Samsung should have at least offered 8GB of RAM and 256GB of storage. In recent times, Samsung has not launched any laptops or notebooks in India. Therefore, I doubt if the Samsung Galaxy Book 2 will ever come to India. Also, even if it launches in India, it will come with a price tag of around INR 90,000, and at that price point, it will make no sense buying it. Indian consumers are more about productivity and practicality rather than portability.